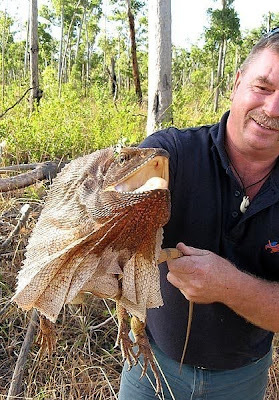 The frilled or dragon lizard seems like a remnant from prehistoric times. In fact, this large reptile with a built-in parachute might remind fans of the 1993 movie Jurassic Park of the Dilophosaurus. 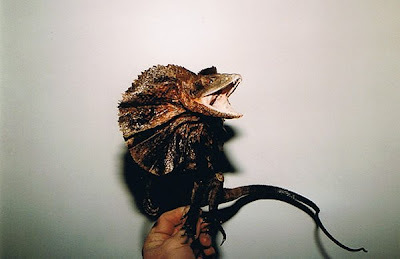 Though the dinosaur’s ruffles in the movie were purely fictitious, the dragon lizard’s frills are not. It hisses and puffs up its neck frills in a display of aggression that intimidates rivals and predators. Look at that long tail! 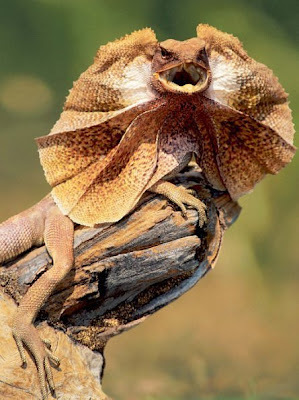 The frilled-neck lizard, also called frilled lizard or frilled dragon (Chlamydosaurus klingii), is famous for its spectacular neck frill, displayed when it feels disturbed, alarmed or threatened. Most of its time though is spent in the safety of trees in tropical savannah woodlands in its native habitat ranging from northern Australia to southern New Guinea. 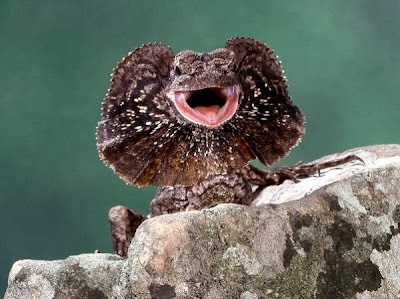 There is only one recorded frilled-neck lizard species so far. 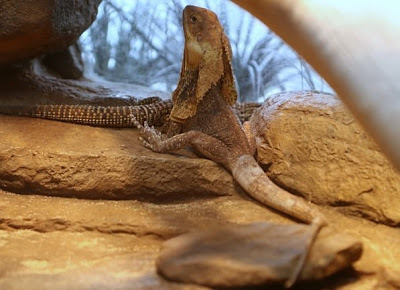 At up to 90 cms (3 ft), frilled dragons are large lizards that surprisingly feed mainly on insects. Cicadas, beetles, ants and termites are part of their diet, and they love butterflies and moths but occasionally also tuck into spiders, other lizards and small mammals. Being otherwise fairly expressionless like most reptiles, there is really no warning sign as to when rivals or predators have overstepped the line. 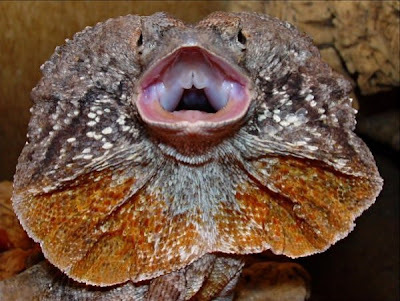 Suddenly, the lizard will raise its frill – not unlike an umbrella – and also open its mouth wide, making a threatening hissing sound. Its display of aggression also includes darkening its color and rocking on its hind legs. We wouldn’t want to cross it then! 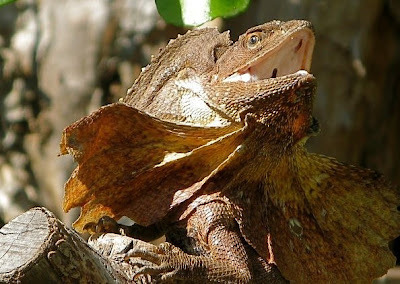 Here’s some action-packed footage of one frilled lizard feeding, then fighting with an intruder and finally running away to safety from a predator. 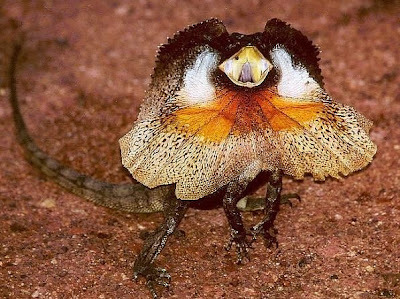 The frill-necked lizard’s colouring is said to be Australia’s most spectacular but it depends on the location. 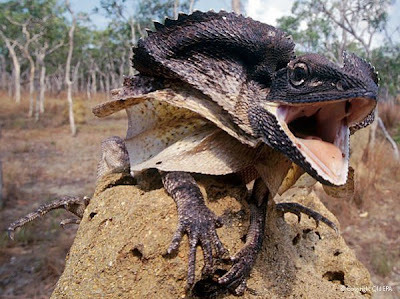 Northern Territory and Western Australia frilled lizards are usually red with yellow and orange frills, whereas those in the eastern territories are usually uniformly gray to brown, all depending on what colours will camouflage them best.